For 50 years, space innovation meant scaling Apollo-era technologies into ever larger, more durable satellites parked above their terrestrial clients in geosynchronous orbit. Exotic space-ready parts, militarized defenses, and layered redundancies ballooned into multi-billion-dollar systems designed to last 40 years or more beyond their conceptions. Only vast organizations with thousands of aerospace engineers could participate. By the turn of the century, it didn’t matter that geosynchronous orbit resembled a stadium parking lot on Super Bowl Sunday. The internet had upended and bankrupted the commercial space industry, whose expensive, decades-old satellites could no longer compete with terrestrial means of moving information. And when a financial crisis gripped the global economy one decade ago, constricting the government budgets that funded most space exploration, NASA’s cancellation of its flagship programs seemed to ring the death knell for our colonization of the cosmos. The space community was dispirited; no one expected an imminent, explosive emergence of a new entrepreneurial ecosystem that now promises unprecedented opportunities in space and vanishing barriers to extra-terrestrial commerce. The prospect of colonizing the moon, Mars and beyond now seems likely and even palpable. Space colonization began in 1957 with the launch of Sputnik, followed by the monumental Apollo program that landed humans on the moon. Both Sputnik and Apollo had to develop their entire missions and supply chains from scratch: rocket engines, spacecraft, avionics software, space suits, ground stations, mission control software and more. This monolithic approach dominated space missions for decades… until recently. In 2010, Brooklynite Luke Geissbühler and his son Max heralded a new model for space exploration when their amateur weather balloon ferried an iPhone 19 miles above the surface of the Earth, capturing beautiful space images as expensive satellites do. The father-son duo’s fun experiment exploited the low cost of mass-produced cell phones, whose batteries, antennas, radios, accelerometers and cameras constitute the most fundamental components of commercial satellites. Meanwhile, students at Cal Poly and Stanford were using those same cell phone components to assemble what they called CubeSats — 10x10x10 cm buses designed to cheaply ferry their science experiments to low Earth orbit (LEO). (In LEO, where satellites naturally de-orbit within five years because of drag from atmospheric particles, they don’t need exotic radiation-proof parts.) Standard modules for DIY CubeSats can now be procured on hobbyist sites as easily as buying a book on Amazon. Like the DARPA engineers who coded the internet protocol, these students hadn’t appreciated the impact of their invention. CubeSats sparked a realization that true scalability comes not from bigger satellites, but many cheap small ones, and suddenly five accumulated decades of Moore’s Law turned the space industry upside down. This new space stack promises a virtuous cycle of innovation, diversity, and growth. Venture-backed startups like Planet Labs and Skybox (now merged) developed constellations of micro-satellites to image the Earth far faster than enormous, lumbering incumbents. Other ventures like SpaceX and OneWeb are deploying massive constellations to serve the planet with internet and IoT communications. The Silicon Valley teams behind all these constellations naturally focus on software-driven designs with commodity hardware, enabling satellite operators to quickly launch new apps as we do on our smartphones. The largest general purpose CubeSat constellation — roughly 60 “Lemurs” operated by Spire Global — already monitors ships, planes and weather. The new mindset that space is best colonized by smaller, cheaper and faster computers favors entrepreneurial engineering teams. Hundreds of other startups are now exploiting the 100X cost savings of microsat constellations to colonize space. The microsat revolution demands a new ecosystem to support the operators of these constellations. By far the most important and difficult input to procure is launch, because all mature rocket programs were designed long ago to carry enormous, expensive payloads to geosynchronous orbit (approximately 36,000 km altitude) with five to 10 years of advance notice; new players like Virgin Orbit and Rocket Lab promise cheap and frequent carriage to LEO (less than 2,000 km altitude). Next-gen operators also need ground stations, mission control software, satellite tracking, data analysis, space Wi-Fi and more. Satellite and rocket manufacturers, in turn, need specialized subsystems, amplifiers, phased array antennas, miniaturized propulsion, materials, extensible solar panels and batteries. 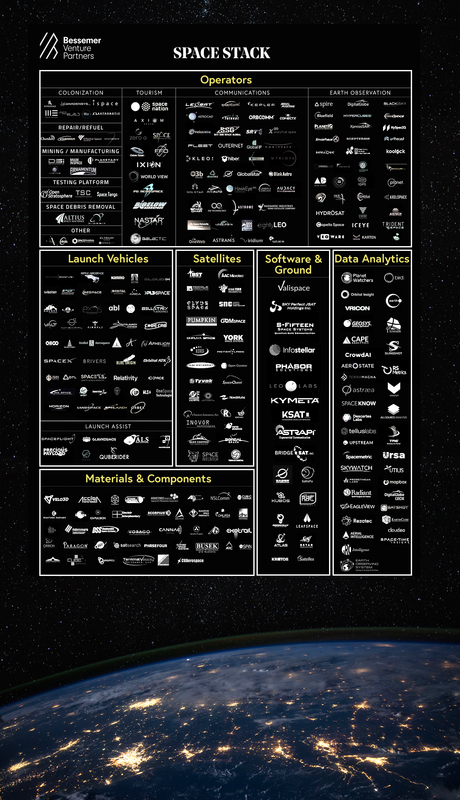 Space companies now assemble cheaper, better and faster constellations by mixing and matching off-the-shelf elements from this emerging fragmented ecosystem. This new space stack (see illustration) promises a virtuous cycle of innovation, diversity and growth akin to the explosion of datacom startups sparked in the 1980s when the OSI 7-Layer network model similarly disrupted an oligopoly of proprietary networks from IBM, Digital HP and Sun. Atop the space stack sit the microsat operators that create value for people on Earth. They are extraterrestrial mining companies, agricultural intelligence businesses, pharma manufacturers, internet service providers, weather forecasters, marine tracking companies and new ones every month. As the space stack grows, these companies look less like scientific research labs and more like their terrestrial competitors. In other words, space is open for business. Entrepreneurs are flocking to the final frontier, where Moore’s Law has unleashed massive, enduring opportunities. This is how humanity will colonize cis-lunar, the moon, asteroids, Mars and beyond — through the emergence of a distributed, commercial ecosystem infinitely more powerful than any single company or government.